If your child is eligible for the At Home Program you could receive Medical Benefits and/or Respite Benefits. If your child has a diagnosis of Autism Spectrum Disorder (ASD) he or she is eligible for autism funding. Parents and caregivers will learn positive parenting strategies that enhance their child's development through individualized consultation and support. Providing programs and services to children diagnosed with an Intellectual Disability Diagnosed with Autism Spectrum Disorder,or eligible for the At Home Program that includes children who are assessed as dependent in at least three of four functioning activities of daily living. Key Workers providing child and youth specific information, advocacy, support, advice and access to community resources to families of children and youth who have been diagnosed with Fetal Alcohol Sydrome and other complext developmental and/or behaviour disorders. Matthew's House provides individualized, quality care in a homelike environment for children with complex care needs. The Mayday Club Youth Choir is an inclusive rock music team made up of children, youth, and young adults with and without autism. We are the only touring rock music group for autism advocacy in BC. Provides an opportunity for children and youth to participate in groups with a focus on social skill development, peer relationships and community inclusion. Some communities may have after- school care for youth aged 12 to 19. Sports programs for individuals with an intellectual disability. Be a fan of tolerance, empowerment, and dignity. Be a fan of Special Olympics. STAR Club is a dynamic program providing social, recreational and skill training opportunities for children and teens of diverse abilities within group settings. A social worker will help you plan for your child during the transitional years from adolescence to adulthood. We have partnered with BC Wheelchair Basketball Society to present this fun, fast paced sport that is sure to challenge and excite. Specially trained coaches will teach fundamental movements through drills and games. Limited number of sport wheelchairs available for use. 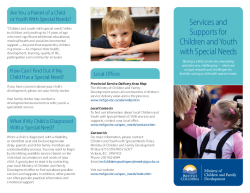 View supports and services for children & youth with special needs provided by the Ministry of Children & Family Development.